Not to be confused with Anderson Park (disambiguation). Brandon Paak Anderson (born February 8, 1986), better known by his stage name Anderson Paak (/pæk/ or /pɒk/; stylized as Anderson .Paak), is an American musician and record producer from Oxnard, California. He released his debut album, O.B.E. Vol. 1 in 2012, under the pseudonym Breezy Lovejoy. He went on to release Venice in 2014, under his current moniker. Paak followed with Malibu, in 2016, which received a nomination for Best Urban Contemporary Album at the Grammy Awards. Apart from his solo career, Paak is also one-half of NxWorries, alongside record producer Knxwledge. He is accompanied by the band The Free Nationals, who play a variety of instruments such as electric guitar, bass, piano, keyboards and drums and also serve as backing vocalists. Anderson .Paak was born in Oxnard, California on February 8, 1986. His mother is of African American and Korean ancestry and his father was African American. At the age of seven, Paak witnessed his estranged father attack his mother: "My little sister and I went out front and my pops was on top of my mom. There was blood in the street. He was arrested and that was the last time I saw him. I think he did 14 years." Paak began producing music from his bedroom as a teenager, while attending Foothill Technology High School. His first experiences performing were as a drummer at his family's church where he met and married his first wife. After a few years, they divorced, and when Paak was teaching at a music school, he met his second wife, a music student from South Korea. In 2011, prior to being a successful working musician, Paak was working at a marijuana farm in Santa Barbara. He was let go without warning, becoming homeless together with his wife and infant son. In 2011, Paak had started earning acceptance in the Los Angeles music world as he worked on his debut album. Shafiq Husayn of Sa-Ra helped Paak recover financially from losing his job in Santa Barbara by employing him as an assistant, videographer, editor, writer and producer. He completed O.B.E. Vol.1 and released the album in mid-2012. He became the drummer for American Idol contestant Haley Reinhart. On November 27, 2013, Paak produced and recorded Cover Art, an all-covers EP. Paak was inspired by the white artists of the 1950s who achieved commercial success by remaking songs written by black blues and R&B singers, while hardly ever compensating the original artists. Cover Art reversed the process and transformed folk and rock classics from white musicians into a mold of soul, funk, jazz, left-field pop, hip-hop, and R&B. The album was released by the independent Hellfyre Club and OBE labels. Paak was the lead producer for Watsky's 2014 album All You Can Do and is featured on three of its tracks. On October 28, 2014, Paak released Venice, his debut album as Anderson .Paak, on OBE and Steel Wool. Paak performed on six songs on Dr. Dre's 2015 album Compton and two on The Game's The Documentary 2.5. In October 2015, he announced that he had recorded material with ScHoolboy Q and 9th Wonder. 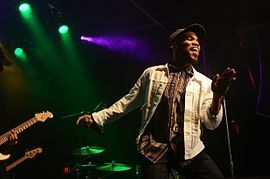 Paak released his second album, Malibu, on January 15, 2016, to critical acclaim, featuring contributions from 9th Wonder, Rapsody, and Kaytranada. In January 2016, he indicated that he had been recording with Flying Lotus. On January 30, 2016, Paak spoke with Scott Simon of NPR's Weekend Edition Saturday about his tumultuous background as a child of mixed-race parents, that the "." in his name stands for "detail", his apprenticeship with Dr. Dre and how all of these influences shaped his music. On January 30, Paak announced via Twitter he has signed to Dr. Dre's Aftermath Entertainment. He said he always sends his ideas to Dr. Dre and the two work very fast. In 2016, Paak was named one of the XXL Freshmen, along with Lil Dicky, Desiigner, Dave East, Denzel Curry, Lil Yachty, G Herbo, Lil Uzi Vert, 21 Savage, & Kodak Black. In 2018, Paak's new single "Til It's Over" featured in a new TV commercial released by Apple Inc. The advertisement was directed by Spike Jonze, featuring FKA Twigs in the video, promoting the Apple HomePod smart speaker. In an interview with Complex magazine posted on October 10, 2018, Paak revealed that his forthcoming album Oxnard will be released on November 16, 2018. Paak released his third studio album Oxnard on the 16th of November. The album is executive produced by Dr. Dre and is a homage to Paak's hometown in California. The album has a heavy funk theme throughout the project and features artists such as Kendrick Lamar, Snoop Dogg, Pusha T, J. Cole and Q-Tip. He also co-wrote 2 songs on the sixth album from Christina Aguilera, Liberation in 2018. On December 3, 2018, Anderson Paak announced a world tour in support of Oxnard. The tour is titled "Andy's Beach Club" and begins in the USA on February 11, 2019 before heading over to Europe. On February 27, 2019, he announced that he will release his fourth album, Ventura, in April 12, 2019. He also announced a new tour, titled "The Best Teef In the Game Tour" with his band, The Free Nationals. The tour will be supported by Thundercat, Mac DeMarco, Earl Sweatshirt, Noname, and Jessie Reyez. The Grammy Awards are annual awards presented by The Recording Academy to recognize outstanding achievement in the mainly English-language music industry. ^ Munday, Matt (April 10, 2016). "Anderson .Paak: 'If Dre had called five years ago, I don't think I'd have been ready'". The Guardian. Retrieved 10 July 2017. ^ Kennedy, Gerrick D. (March 4, 2016). "Anderson .Paak hits big time in L.A. after struggling up the road but a world away in Oxnard". Los Angeles Times. Retrieved 10 July 2017. ^ "Anderson .Paak Talks Working w/ Dre & His Go To As a Wedding Singer! [VIDEO]". WQHT. December 3, 2015. Archived from the original on December 4, 2015. Retrieved February 9, 2019. ^ Reeves, Mosi (November 1, 2014). "10 New Artists You Need To Know: November 2014 – Anderson Paak". Rolling Stone. ^ a b "Review: Anderson .Paak More Than Makes Up for Lost Time on 'Malibu'". spin.com. ^ Martins, Chris (January 14, 2016). "Anderson Paak: Dr. Dre's Golden Child Goes From Protege to Solo Star". Billboard Magazine. ^ a b Weiss, Jeff (November 27, 2013). "R&B singer Anderson Paak has a curious new project". LA Weekly. ^ "The Sound of Tomorrow with Anderson .Paak & The Free Nationals (LIVE)". theecho.com. Retrieved 15 January 2016. ^ "Cover Art". hellfyreclub.bandcamp.com. Retrieved 15 January 2016. ^ "Life After Dre: Anderson .Paak on "Compton," Style & His New Album - DJBooth". DJBooth.net. Retrieved 2015-10-23. ^ "BBC Radio 6 Music - Gilles Peterson, Ed Motta and Anderson. Paak". Bbc.co.uk. 2016-01-16. Retrieved 2016-05-12. ^ "Anderson .Paak: 'The Dot Stands For Detail'". npr.org. Retrieved 2016-01-30. ^ "Andy $ide$tick on Twitter: "Aftermath gets the last laugh ". Twitter. 2016-01-30. Retrieved 2016-05-12. ^ Smith, Trevor (19 November 2016). "Anderson Paak describes relationship with Dr. Dre". Retrieved 19 November 2016. ^ "Apple HomePod Commercial". 20 March 2018. Retrieved 20 March 2018. ^ Yoo, Noah (February 27, 2019). "Anderson .Paak Announces New Album Ventura and Tour With Mac DeMarco, Earl, Thundercat, More". Pitchfork. Retrieved February 27, 2019. ^ Vulpo, Mike (October 5, 2016). "BET Hip Hop Awards 2016 Winners: The Complete List". E! Online News. Retrieved December 7, 2016. ^ "59th Annual GRAMMY Awards Winners & Nominees - GRAMMY.com". GRAMMY.com. The Recording Academy. Retrieved December 7, 2016. ^ "61st Annual Grammy Awards Winners & Nominees". Grammy. ^ Iasimone, Ashley (November 27, 2016). "2016 Soul Train Awards: See the Full Winners List". Billboard. Prometheus Global Media. Retrieved December 7, 2016. This page was last edited on 13 April 2019, at 17:12 (UTC).